I’m eating the first week of a two-week meal plan from the No Meat Athlete Marathon Roadmap 3.0 this week. My marathon is April 27, but I started the 2-week "get ready for the race" plan a week early so I could take a week break in the middle while I’m vacationing in FLORIDA! 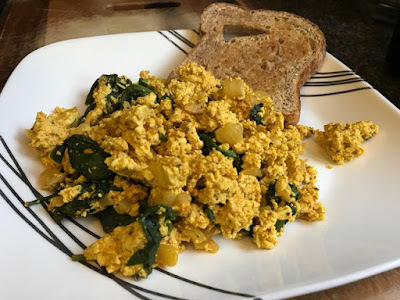 We fly out to Ft. Lauderdale Sunday morning, so I wanted to check in and share the meals I had in days 5 and 6 (and breakfast on Day 7) before I start sharing delicious vacation meals! 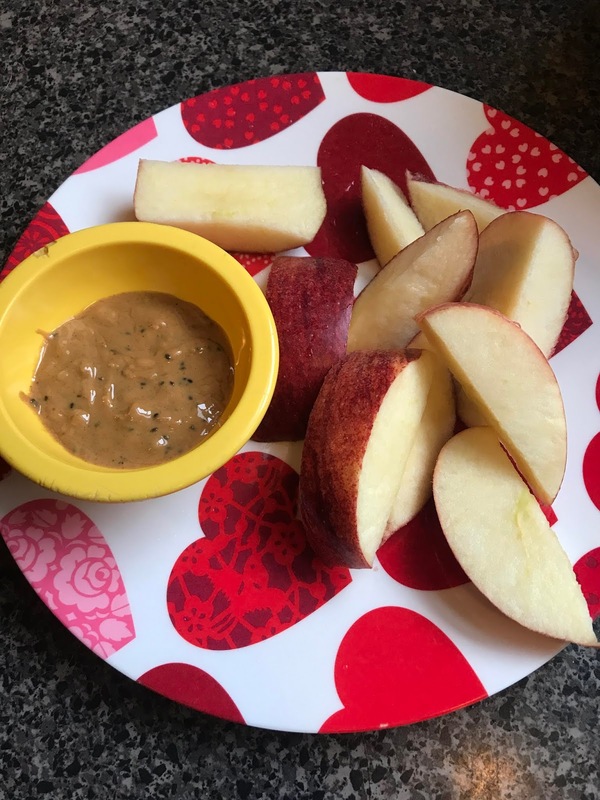 Friday morning started with an apple-spinach-flax-banana smoothie, and morning snack was coconut oil-popped popcorn with sea salt (didn’t take a pic, but you know what popcorn looks like). Lunch was leftover quinoa stir-fry from Thursday night (pic in my last post). Afternoon snack was, as always on this plan, a salad. And dinner was Seared Tofu with Broccoli Over Brown Rice. This simple stir-fry was made with air-fried tofu, sauteed broccoli (plus a few brussels that I needed to use up before my trip), sesame seeds, and soy sauce. That’s it. Served over brown rice. I was supposed to run 13 miles on Saturday morning, but I woke up to a very rainy day and a very busy schedule with so much to do before I can leave town. So I did something I rarely ever do — I skipped a training run! I hate not checking the boxes on my training plan, but sometimes you know you just need a rest day. I’m in the taper period of training anyway, so I think it’s okay. I had a mango-jalapeno smoothie, followed by an Apple with Peanut Butter while I cleaned my house. My parents are house-sitting so I wanted the place to be clean! Lunch was leftover tofu and broccoli stir-fry, and my afternoon snack was another salad. 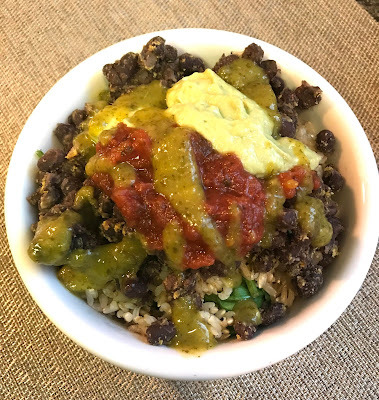 Dinner was Black Beans & Brown Rice with salsa, avocado sauce, and green hot sauce. Oh, and I mixed some baby spinach in there! Beans and rice really hit the spot sometimes! Sunday morning isn’t here yet! But I’m supposed to have the Easy and Awesome Tofu Scramble, which is the same recipe from the No Meat Athlete Health Made Simple plan I did last fall. Here’s a pic from a past plate of that. I’ll be eating this bright and early (around 4 am!!) since we have a very early flight. I like to eat a big breakfast before flying since you never know how long it will be before you can find vegan food! I hope to get a few blog posts done while we’re there. But if you don’t hear from me for a bit, it’s cause I’m having too much fun to post!